I have had salad spinners before and given them away however I come to realize how useful they are for spinning washed herbs as well as salad leaves. 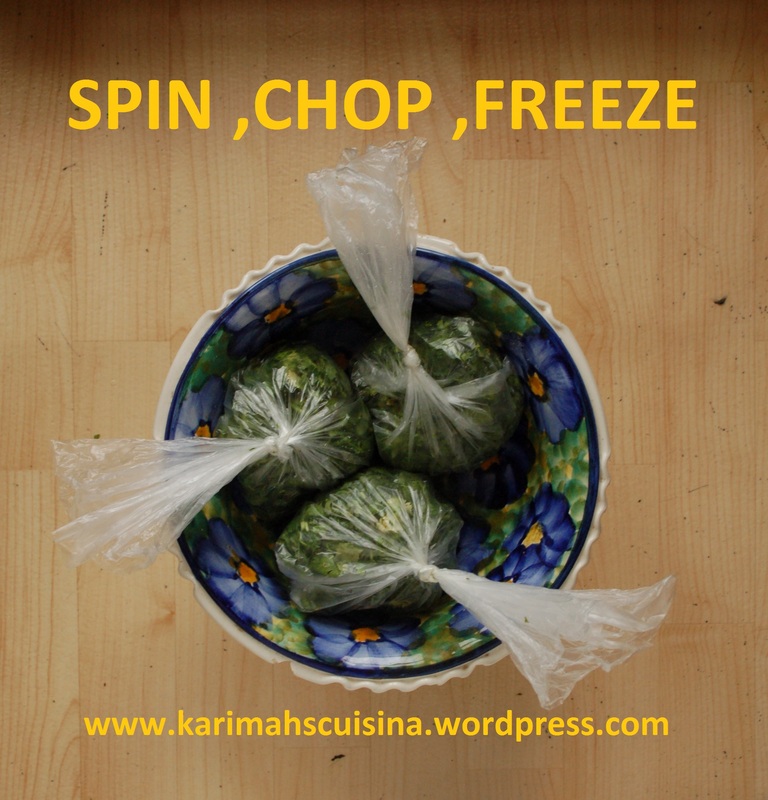 Herbs can be washed spun and chop, then placed in sandwich bags and frozen to use later. It’s best to grown your own or buy the freshest herbs you can afford, especially if you are going to freeze them. After washing the herbs, hang them up to drain for 30 minutes. Then cut off the earthy ends if necessary. 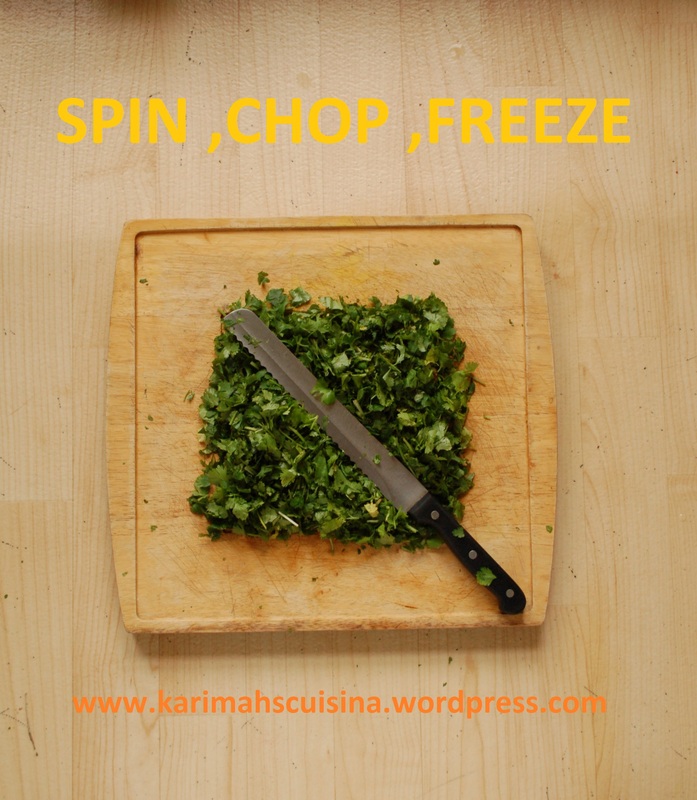 Chop into large chunks to put in salad spinner. This is an alternative to patting them dry. Wind it round and let the water spin out. It’s an alternative to patting them dry. After spinning either chop with knife or food processor. The food processor gets them really fine and they can be packed into ice cube trays. we just put them into sandwich bags and tie them because we don’t need finally chopped herbs; our soups get blended after cooking , otherwise they get blended in smoothies. Frozen herbs in most cases are better than dried herbs and still add a zing to soups and other cooked dishes and provide essential nutrients in your delicious green smoothies. In the winter its more cost effective to use herbs that have been frozen from summer / autumn. 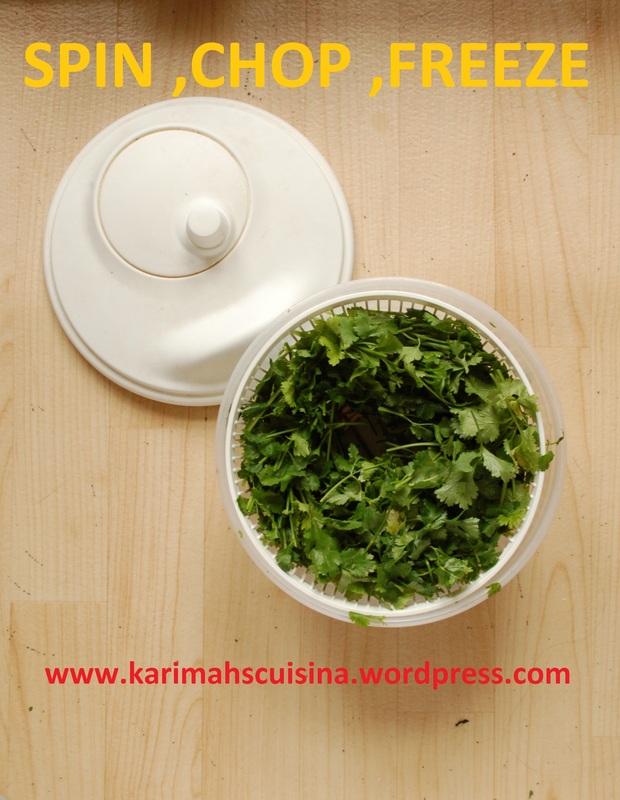 For those of us who are fasting Ramadhan insha’allah, its also quicker and more convenient to use frozen herbs, especially that you have prepared yourself because you know how fresh they were when they went in the freezer. Labeling your bags of herbs is essential if you are freezing lot of different herbs. You can use Freezer Marker Pens for this job.